Prep a cupcake pan (12 spots) with cooking spray. Dice your choice of vegetables to fill 3 green containers (3 cups) - If using frozen veggies, measure, then cook them quickly to remove the excess liquid frozen veggies contain. You don't want watery egg muffins. You can slightly cook down fresh veggies if you like them less crisp, too. Beat eggs in a bowl, season with black pepper and then mix in your vegetables. Pour the egg and vegetable mixture into your prepared baking pan. Bake at 350 for 15 minutes, or until eggs are cooked through. Store in the fridge and heat up in the microwave for about 30 - 60 seconds (depending on your microwave) when ready to eat. On the 21 Day Fix program, each serving of 4 egg muffins equals 1 Red container and 1 Green container. 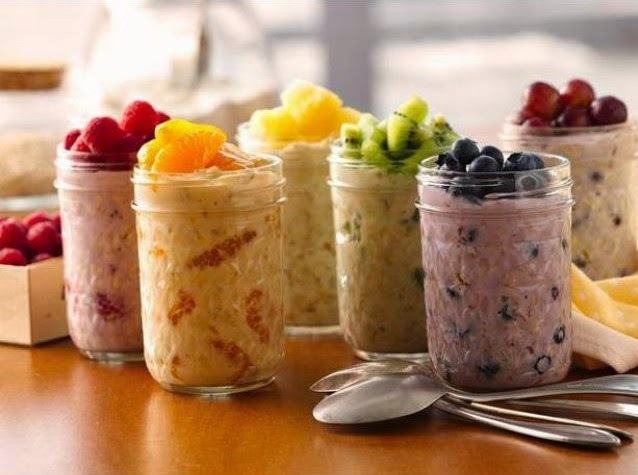 Portion out your fruit, yogurt and uncooked oatmeal. Combine all your ingredients in a mason jar or tupperware container. After everything is added in the container shake it up! Close the container and refrigerate overnight. Yes it is THAT simple! You now have a grab and go breakfast for the next morning. If following the recipe above you will be using- 1/2 yellow, 1 red, 1 purple and 1 blue.